Home Crepe Blog A Great Start to Movember! A Great Start to Movember! Did you know that Movember is the month previously known as November, where men and women across the globe join their efforts to raise awareness for men’s health issues? The rules are simple. Men grow a MO(ustache) for the entire month to become talking billboards and raise money along the way. In 2012 Canadians raised the most money of all the participating countries during Movember. On Dec. 1 (official shaving day), a total of 247,066 Canadians had participated, raising $36.8 million. Women who support Movember, known as Mo Sistas, support their Mo Bros by organizing events and starting teams. So Canadian Mo Bros and Mo Sistas..let’s change the face of men’s health! This is a special time of the year, when families come together to get a head start on holiday cheer! This season you can surprise your guests with sweet & savoury crepes made to order by our friendly and experienced staff members. Our crepe catering works perfectly in any location and regardless of the occasion, we will provide a lovely set up to accommodate your needs. With zero stress and delicious food, Crepe Delicious catering will make your gathering a memorable event! And last but not least, November is also the perfect time to start your Christmas shopping. You’ll beat the rush and leave yourself time in December to enjoy the festive season. And for a shining start, come try our November temptation: Choco-Dream, a chocolaty twist on our classic crepe, with fresh strawberries and chocolate drizzle. 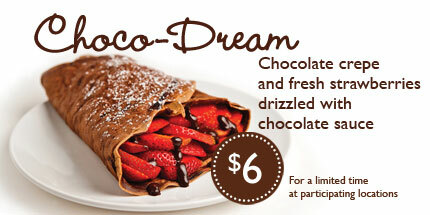 For only $6 all month long, we’ve got your wallet and your sweet-tooth covered! Office Christmas Parties, Home Parties, Bridal & Baby Showers, Wedding Receptions, Birthdays, Corporate Meetings, Team Building, etc.